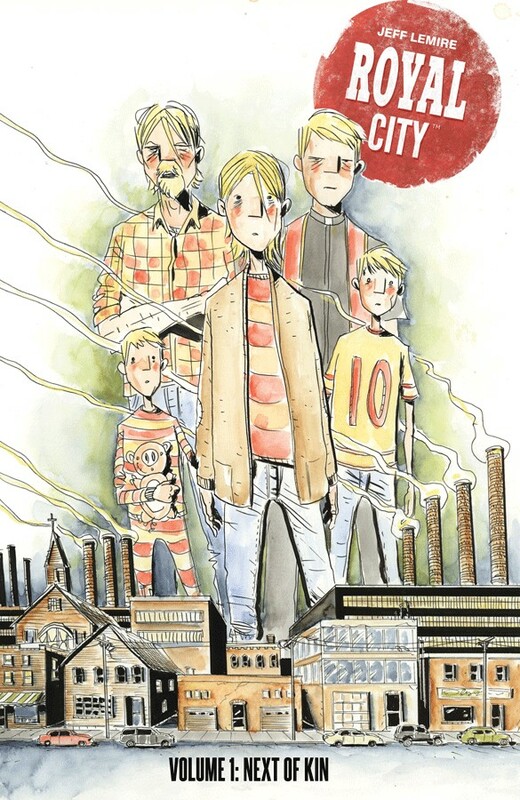 In his most ambitious and most personal project to date, JEFF LEMIRE spins the captivating and engaging story of a family from the small factory town of Royal City and the ghosts that haunt them. In a return to the literary and thematic territory of LEMIRE’s breakthrough graphic novel Essex County, ROYAL CITY follows Patrick Pike, a fading literary star who reluctantly returns to the once-thriving factory town where he grew up. Patrick is quickly drawn back into the dramas of his two adult siblings, his overbearing mother, and his browbeaten father, all of whom are still haunted by different versions of his youngest brother, Tommy, who drowned decades ago. As each member of the family struggles to keep themselves above water, it quickly becomes clear that Tommy’s death isn’t the only dark secret tearing the town, and this family, apart at the seams. Can each member of the Pike family come to terms with their own guilt over Tommy’s death, and make peace with the many versions of Tommy that still haunt them, or will they all be dragged down below the river along with his lingering ghost? ROYAL CITY promises to be a sprawling serialized graphic novel that will chart the lives, loves, and losses of a troubled family and a vanishing town, across three decades. JEFF LEMIRE is the creator of DESCENDER (with DUSTIN NGUYEN), A.D.: AFTER DEATH (with SCOTT SNYDER), Roughneck, Secret Path (with GORD DOWNIE), PLUTONA (with EMI LENNOX), Essex County, Sweet Tooth, Trillium, and The Underwater Welder. He had also written celebrated stories featuring Green Arrow, Animal Man, Bloodshot, Wolverine, Hawkeye, Teen Titans, the Valiant, the X-Men, and Inhumans for the major comic book publishers.